Astoria / August 20, 2010 / Queens Buzz. On Wednesday afternoon I set to work on this story after returning from a fascinating four hour visit with Michael Halberian, owner and whose family occupied, the Steinway Mansion for the past 82 years. The mansion is located in Astoria, just north of 19th Avenue on 41st Street [map link provided at end of story]. 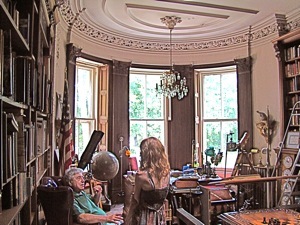 Michael regaled me with anecdotal tales supported by the many books off his shelves, or by pointing to numerous remnants of the past, kept in pristine shape in this beautiful old Astoria mansion on the hill overlooking the East River. 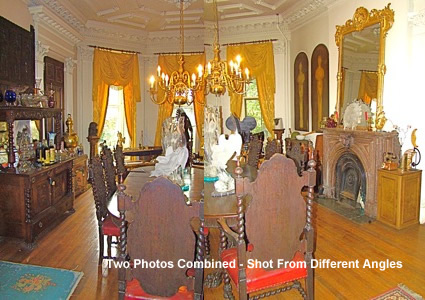 Click here to read more about the Steinway Mansion For Sale In Astoria Queens. Astoria / August 18, 2010 / Queens Buzz / Continued. The Steinway Mansion has been put up for sale. 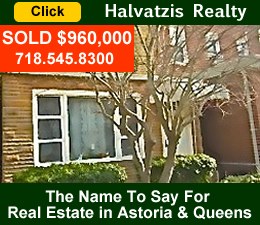 This prize piece of Astoria real estate, awash in Astoria, Queens and NYC's history, is being co-brokered by two realtors: Halvatzis Realty of Astoria Queens and Douglas Elliman of Manhattan NYC. This report is far more than a story about an historical landmark for sale, it is about preserving some of Astoria's, Queens and NYC's glorious 19th century past. The Halberian family has lived and maintained the mansion for over 80 years. Michael Halberian was born in the mansion in 1927, and is currently in the process of trying to find the mansion's fourth owner. I had the opportunity to spend a few hours with Michael, while he graciously allowed me to tour and photograph the mansion and many of its belongings. Michael brought alive this wonderful old mansion's fascinating past, and with it, Queens, New York’s and in fact, America’s history. The landmark building was built in 1857 - 1858 by Benjamin Pike. Benjamin Pike was a purveyor of optical and scientific instruments. 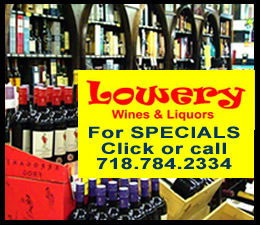 He ran a prominent store in lower Manhattan across from city hall. 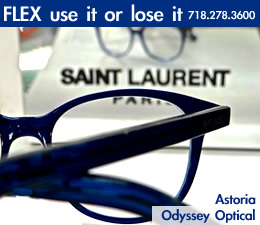 Pike had studied optometry in England and was one of the first opticians to come to America in 1847. 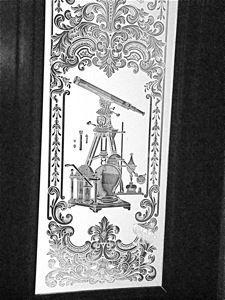 Over 150 years later, Benjamin Pike's interest in optometry and telescopes is still present throughout the Steinway Mansion. 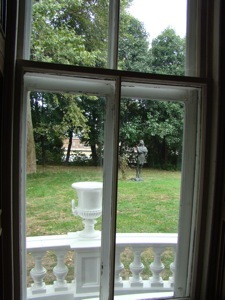 There were several telescopes scattered throughout the mansion, as well as an imprint on one of the etched glass windows of the entrance to the mansion's main foyer [see photo to right]. 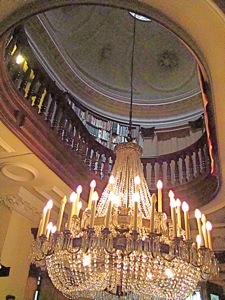 It's also worth noting that the mansion has a crow's nest, high above the third floor, from which one can see in all directions. Although on the hot summer day I was there, shady leafy foliage from the nearby trees obstructed some of the views. I can imagine in Benjamin's Pike day, he could easily study the heavenly skies with his telescopes from his beautiful country home. There would have been little interference from man made light as his home was a two hour trip [including ferry ride] from lower Manhattan, which would be considered no more than a small town today, and there wasn't yet any electricity. Pike and his wife lived in the mansion until his death in 1864. 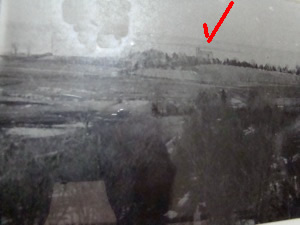 In the photo below right the Pike Mansion is just under the red check mark. 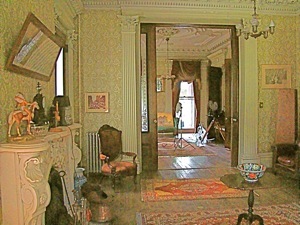 A few years after his Pike’s death, his widow sold the granite mansion to William Steinway in 1869 - 1870. At the time William Steinway, one of Henry Steinway's sons, was instrumental in moving the company of Steinway & Sons from Manhattan to Astoria. 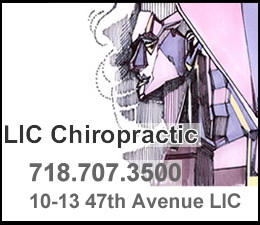 Prior to 1870 Steinway pianos were made at various locations throughout Manhattan. Michael informed me that the conscription riots by the Irish during the Civil War prompted Steinway to re-think keeping Steinway & Sons Piano Factory on the increasingly crowded island of Manhattan. The conscription riots occurred when the Irish protested the U.S. government's practice of allowing the wealthy to opt out of military service in exchange for money. So following the Civil War, beginning in 1870, the Steinways moved their home and business affairs out to Queens. 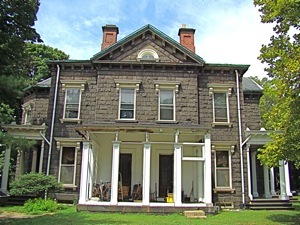 By 1870 the Steinways had purchased Pike's Mansion as well as a large 400 acre tract of northwestern Queens. Upon this land they began building their factories and an entire company town along with it. The town included a church, school, library and a horse-drawn trolley to move people to and fro within the town which was called Steinway village. See related story on Steinway & Sons Piano Factory. The Steinways were quite successful and eventually their business interests turned to transportation. In the 1890's the Steinways decided to expand the trolley service into Manhattan by digging a tunnel under the East River. While the Steinways never completed the tunnel, in time the work they'd done, eventually became the tunnel for the subway line. The Steinways also set up an engine manufacturing company in the late 1800's in some sort of loose relationship with the Daimlers of Mercedes fame of Germany. As Steinways were wealthy 19th century industrialists, it came as no surprise when Michael told me that Grover Cleveland came to dinner here in the 1880’s. President Cleveland is said to have eaten in the Media Luna dining room [a name probably given by Pike], which largely remains unchanged from the day the deceased president reportedly visited. 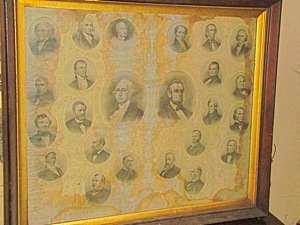 We weren't able to cross reference this visit, but it's worth noting that I found an old portrait of the U.S. presidents in a room on the third floor where I counted 24 presidents, meaning it was a poster of the presidents from Grover Cleveland’s time. Coincidence? The Steinways, along with George Ehrets, owner of the Hellgate Brewery, also developed the North Beach recreational area, which became an amusement park and beer garden along the East River. It was Queens answer to Coney Island in Brooklyn. But in 1929 the park was razed and converted to an airstrip called North Beach Airport. Eventually the North Beach airstrip became LaGuardia Airport which was opened in 1939. See related story on the Casey Jones School Of Aeronautics aka Vaughn College. In 1896 William Steinway died. 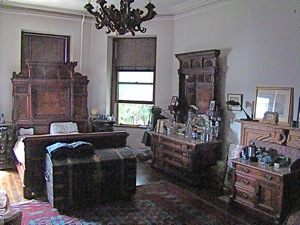 The Steinway family continued to live in the mansion until 1925 when they sold it to Jack Halberian, an entrepreneur, tailor and an Armenian immigrant. 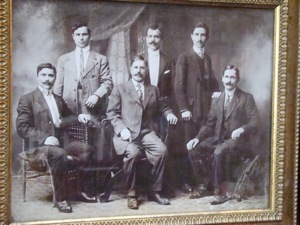 One of the Halberians is seated to the far left in the photo above and is either the grandfather or the father of the current owner, Michael Halberian. I first met Michael Halberian in his study, which is a large room with a high ceiling and a beautifully sculpted skylight. 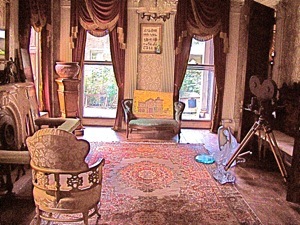 The room was right out of a well done movie of late 19th century aristocratic America. It was a room where science, wealth and a learned idealism comfortably coexisted. 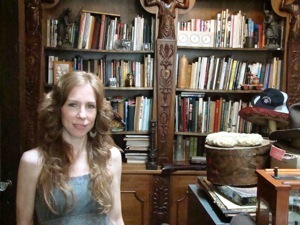 A room containing glimpses of the world's latest knowledge [of the late 19th century] as well as some of the instruments and equipment to go along with it. 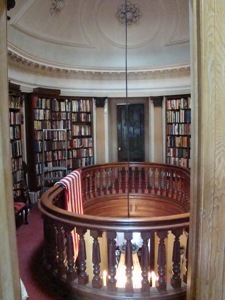 There was a ladder along one of the large floor to ceiling bookcases, so that one could climb to obtain an out-of-reach tome. This room invited me in and enticed me to stay; as did the mansion's owner and resident historian, who graciously asked me to find a seat while we talked. I took a seat at a table in the middle of the room, since it would be easier for me to jot down notes as we conversed. There was a chess set atop the table. Michael started by providing me with the mansion history, much of which I’ve outlined and enhanced above. While we were talking, I couldn’t help but take an interest in the many objets d’science & history that were strewn about the room. Michael reminded me of a history professor, whose interests ran far and wide, as he took me down all sorts of interesting side trails, without losing his initial train of thought. 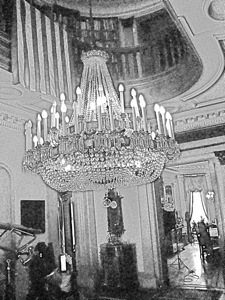 Michael told me how his father, an Armenian tailor, bought the mansion when the Steinways put it up for sale in 1925. His father had saved everything he had made since moving to America in 1913. He had set his sights on the mansion years earlier, seeing it while traveling with friends on a Steinway trolley, likely on a trip to the North Beach recreational area. A realtor / friend who was with him on that trolley ride, remembered his interest in the mansion, and contacted him when the it came up for sale. So Jack Halberian collected everything he had and bought the house for $45,000. Upon taking possession of the home, Jack found it to be a less than smooth transition, as the water and electricity conduits were provided to him complements of the nearby Steinway Piano Factory. The factory terminated these conveniences following the Steinways exit shortly after the completion of the sale. Jack Halberian quickly set about to make things work, investing another $15,000 into repairs and improvements. 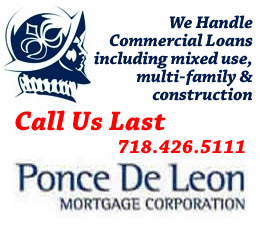 His new wife’s family helped him refinance his investments in 1928 by providing him with $17,000 in loans. In 1929 Jack’s wife’s family wanted their money back as the stock market crashed and everyone was short of cash. To make ends meet, Jack rented out the upper two floors of the house, while he and his family occupied the first floor and the basement. Michael remembers shoveling coal into the furnace during his youth to keep the house warm. Apparently the mansion at the time would consume about thirty tons of coal per season, which Michael informed me would fill half the study about eight feet high. 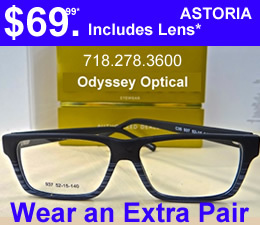 Michael was once appointed the official historian of Astoria by Helen Marshall. A title he’s since relinquished. 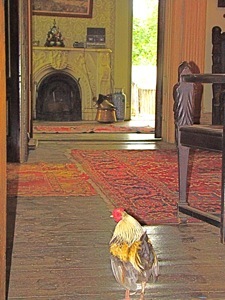 Michael's knowledge of the mansion and its inhabitants is likely the best source of information of this kind. He provided me with much of the information pubished herein about the Pikes and Steinways as well as his own family's history: the Halberians. The mansion contains numerous remnants of America's past. There were two cannons from the American Revolutionary War sitting in the den like they were child's toys. Resting along one of the window sills there was an old beaten up globe that had come from one of the great steamships of a century ago. Steamships that once traversed the world's oceans at breakneck speed. 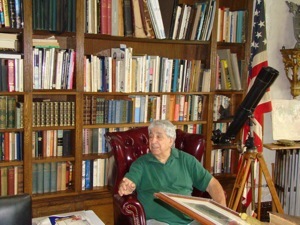 Michael frequently referred to his collection of books, which are generally about the history of New York. He had, over the years, collected many complete sets, the likes of which he informed me, I might never see again. 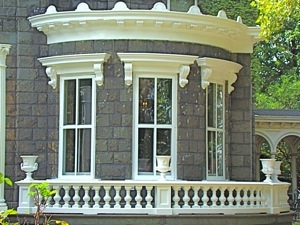 The front of the house overlooks the East River from a high bluff, while the side and back of the house face the street and the rest of Astoria. I stepped out into the front yard to photograph the mansion's granite facade, which continues to this day to have a sturdy, warm, elegance. I circled the house and found the outhouse that Michael had mentioned, which was erected with the mansion [the mansion was eventually one of the first homes to have indoor plumbing]. In the photo to your right is the side view of the mansion, from where you can enter into the main living rooms. Inside the house, off the study, is a foyer. The foyer leads everywhere: out to the main entrance, back into the dining area, up the stairs, as well as off into two separate living rooms, both of which have access to the outer yard. Standing in the center of the foyer, I looked up to see a skylight with an oval rail guarding the hallway on the second floor. As mentioned earlier, the den where Michael and I had first started conversing had a skylight too, all of which had been built when Pike first erected the house. The two side rooms are where I imagine the ladies and men probably convened, separately, following dinner during Grover Cleveland's time. All large rooms on the main floor have fireplaces, which I believe are the originals, made of what appears to be various types of marble, elegantly cut in the fashion of the time. And the living rooms and dining room all had full length windowed doors leading out to porches overlooking the yard. 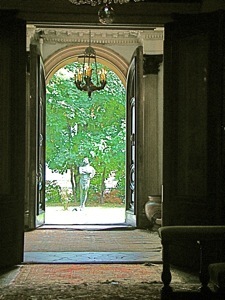 The doors leading from the front vestibule into the main foyer are pocket doors which have etched glass windows. These windows, as previously mentioned, displayed many of the scientific instruments / telescopes which Benjamin Pike so loved. There are many precious, well preserved details to be found throughout the mansion, which would warm a historian's heart. When I returned to the main foyer, Mike pointed out a telescope that he informed me had once sat aboard JP Morgan’s yacht. He drew my attention to a Russian Tea machine in the dining room, and I noticed an old fashioned moving pictures camera, similar to one I’d previously seen in the American Museum Of The Moving Image in Astoria. There was also a suit of knight's armor which I didn't get a chance to ask him about. I started up the stairs to see what I might find. At the top of the staircase there’s the oval rail and bookcases along all of the oval walls which Michael had built. Michael, like his parents before him, also has a tenant who lives on the second floor. She graciously showed me several old prints of New York, a beautiful view of the mansion front lawn, and two Tiffany stained glass windows. Along the back of the second floor are what I believe are Michael’s living quarters. These rooms seemed to be in alignment with the overall feel of the rest of the mansion with beautiful, classically-styled, antique furniture filling the rooms. Much of the furniture appeared to be art deco from the 1920’s and 1930’s, when Michael's family first moved into the mansion. There’s a third floor, which I haven’t much to say about, as it’s primarily used for storage. It's where I found the print / poster of the presidents from Grover Cleveland's time. But, as mentioned previosly, there is a crow’s nest above the mansion and from here one can see all round Astoria. 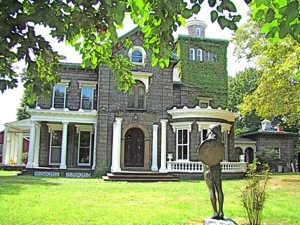 The mansion is perched high on a bluff and overlooks what was once Steinway Village which is now called Steinway Street and Upper Ditmars in Astoria. I dropped down into the basement, which has been modernized. 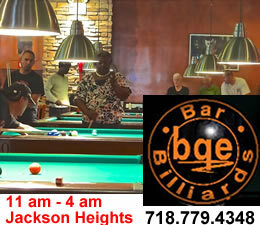 The basement has a Jacuzzi, steam room, two large pool tables and a small bar booth area. At the end of our conversation Michael again drew my attention to his book collection, informing me that it covers much of the history of New York. 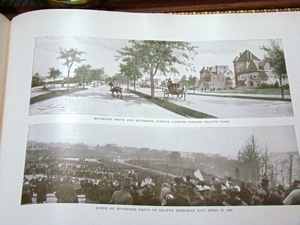 There are beautiful prints and pictures in the books, few copies of which remain. 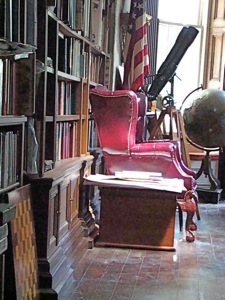 Many of the books are 100 – 200 years old, just like the mansion. 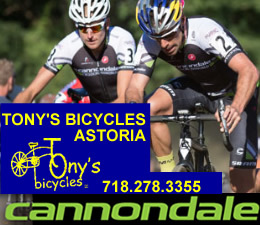 Opinion: Astoria Real Estate Or NYC History? In many senses this house reminded me of a bit of the Voelker Orth Museum in Flushing. It preserves a period of time which I dearly hope will be available for all to see in the years ahead. This can only be possible if the city, state and / or federal government step up to purchase this priceless historical legacy, which is listed price at $2.5 million to $4.5 million [price varies depending on parcel of lots purchased]. As I left, I felt myself yearning for the city to become not just a bidder, but the buyer of this house. It’s unquestionably a landmark not just with its age, but in its history [it has landmark status]. And it still has the charm and warmth that Benjamin Pike first put into his ‘country’ home which he started building in 1857. The Steinway Mansion has the potential to become a home owned by and accessible to all Queens residents, if it's purchased by the government. Queens has a great colonial history, some of which is preserved in Flushing. Queens also has a great 19th century history, little of which has been preserved anywhere in the borough. William Steinway was the quintessential 19th century enlightened American industrialist. He helped usher in the modern era by paying his employees a living wage, providing them with decent housing [not slums], and even developing a recreational park for them [the North Beach Amusement Park & Beer Garden]. In the 19th century, leisure time and recreation for the working classes was a very novel concept. It's currently possible to make the Steinway Mansion a centerpiece of Astoria and Queens History. It has the potential to one day be considered a centerpiece of NYC and America's history in the late 19th and early 20th centuries. I don't think this is an opportunity our Mayor, our Borough President, our City Council and our Historical Societies should let slip by. It can be purchased today, possibly with some of the memorabilia; while a former owner who is also part of the mansion's story, is still around to impart his knowledge of the glorious old mansion's past. Lastly, Michael Halberian has acted as a sort of preservationist, historian and curator of the Steinway Mansion for a better part of his life. He told me that he would like to pass the mansion on to "the right buyer", which I interpreted to be the city or an historical society. He wants to do the right thing and if you agree, I implore you to help him. Please use the email form below to send a link to this story to your friends, family and associates and / or get them to call 311 to ask the Mayor and City Council to buy this property. I'm sure if they receive enough calls [thousands to millions], they'll start negotiating with the sellers to make this happen. To put the purchase price of this house in perspective, the NYC budget last year was about $63 BILLION, so the asking price amounts to .00004% of the budget which is not even a rounding error. Actually billionaires like Mayor Bloomberg or Warren Buffet are wealthy enough to buy it and donate it to the city, but we've contacted both of them and neither responded with interest. Special thanks to Kim Parshley of Halvatzis Realty for informing me about this transaction and facilitating this story. And of course, to Michael Halberian for graciously allowing me to do this story and providing me with much of the information contained herein. The following is the contact information of the two realty companies handling the Steinway Mansion real estate sale. 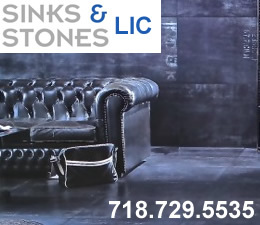 One of them also happens to be one of our clients, Halvatzis Realty, and they have a home page on this site [click link above]. I actually asked them [not the other way around] if I could do this story while the two real estate firms were preparing to market the property. I saw the story as a glimpse into Queens past, not so much as a story about real estate for sale in Astoria. They agreed and that's Kim in the photo to your left. 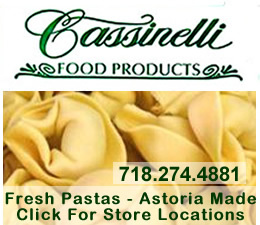 Click on these advertisements for promotions, discounts and coupons by retailers and restaurateurs in Astoria and nearby LIC. What a great article - thank you for this important information. I hope lots of people call 311 to ask the mayor & city council to purchase this historic building and turn it into a museum.